The Pulse is an experimental novel about being, belonging, and the danger of talking to intergalactic strangers. Because it contains multiple narrative threads, is set in different locations, and dips into several genres, I’ve provided brief plot points, maps, and a list of characters. While the basic structure isn’t likely to change, I’m still writing the second half, which often requires reworking previous chapters. (NYC) Prophecy 1: The Political Climate - Curtus Rufius watches the political scene from New York — If Winter Comes - Can Spring Be Far Behind? In the real world there’s only one universe that we know of, although it has greatly expanded since the discovery of other galaxies a hundred years ago. In The Pulse I assume that just as we eventually found other galaxies, so we’ll eventually find other universes, even clusters of universes. In The Pulse there are 13 known universes in a 4-dimensional cosmos. It’s not known if this cosmos is the only one that exists, yet there are no indications of any overlapping, alternate, or mirror universes. The Purple Pulse and The Black Pulse universes are the most ancient universes and are the furthest apart. They’re also by far the largest universes — each containing 360 trillion galaxies. As such, they determine the largest cosmic binary revolution, indicated by the largest of the broken elliptical lines (the revolutions of the universes are more or less circular, yet I’ve used ellipses to give more horizontal detail to the page). The Purple and Black Pulse universes aren’t rotating around the universes at the centre of this diagram; instead, they’re being held in a mutual binary revolution. The centre of the diagram is the barycentre rather than the gravitational centre. The two original universes are so large and exert so much gravitational pull that they take the other eleven universes with them in their extremely long revolution. In the novel The Milky Way galaxy is part of the Violet Hoop Universe, which is part of The Great Triangle, along with The Green Buzz and The Orange Hoop universes. The Great Triangle is held in a larger mutual rotation with the three universes to its right — The Crimson Stalk, Ataari Lok, and The Copper Tarn (collectively referred to as The Grey Phantom). 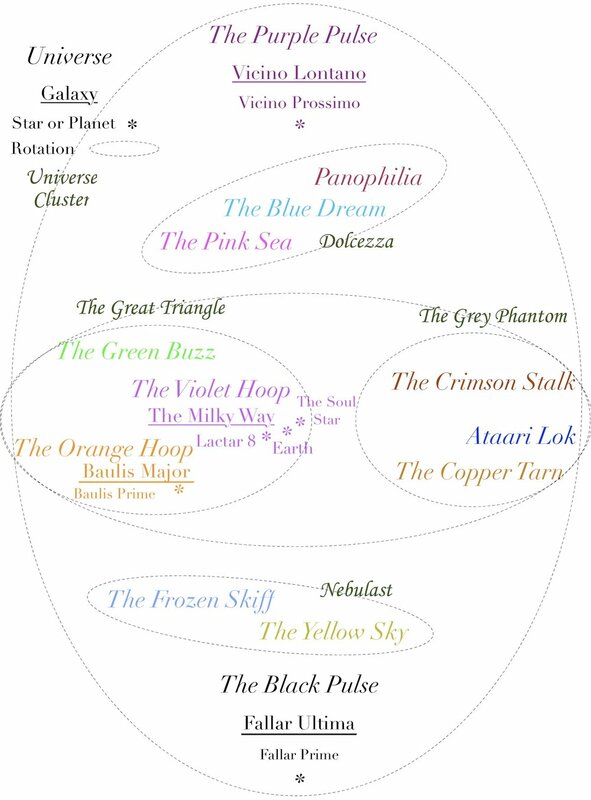 All six of these universes, as well as the three above them (Dolcezza) and the two below them (Nebulast) — are within the larger gravitational pulls of The Purple and Black Pulse universes. The distances between universes are far greater than represented on the map. For instance, The Yellow Sky universe is thousands of times further from The Black Pulse than it is from The Frozen Skiff. The distances involved in this version of the cosmos are literally and metaphorically astronomical. While we presently understand our known universe to be about 28.5 gigaparsecs in diameter (93 billion light-years), in the novel our universe (The Violet Hoop) is about three times that wide — 85 gigaparsecs (277 billion light-years). (A parsec equals about 3.26 light-years; a light-year equals about 9.46 trillion kilometres). The Great Triangle is so large that instead of using gigaparsecs (billions of parsecs) it would make more sense to use ‘exaparsecs’ (quintillions of parsecs). Similarly, the distance between the Purple Pulse and the Black Pulse would require the use of ‘yottaparsecs’ (septillions of parsecs). One yottaparsec would equal 10^24 parsecs, that is, 10 to the power of 24 parsecs, or 1,000,000,000,000,000,000,000,000 parsecs, or 3,260,000,000,000,000,000,000,000 light-years. Exaparsecs and yottaparsecs aren’t used in real-world astronomy because there’s nothing that large in the known universe. The novel is set in 2020; the ages of the characters (in parenthesis) are in 2020.